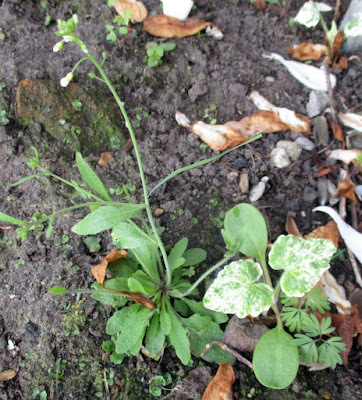 Hairy bittercress is that wretched small weed which appears in late Winter before inexperienced gardeners even think about weeding. 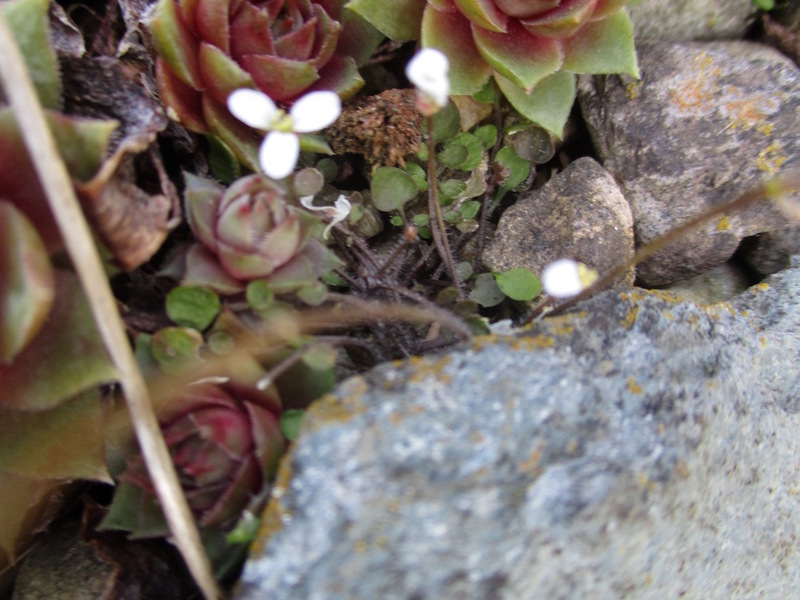 It germinates in empty spaces and soon starts fizzing out seed all over your previously immaculate garden. Described as ephemeral, continued short generations bedevil you for the rest of the year. 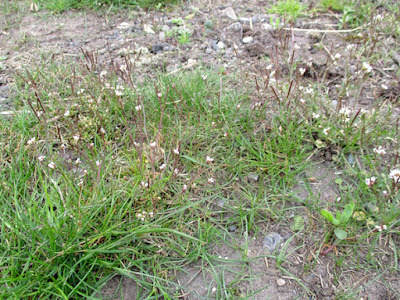 Unless you are alert to its rapid reseeding after as little as a month following emergence you will never be rid of it. Rare as a weed when I was a child, it is a modern phenomenon. (Considering my age, not that modern). 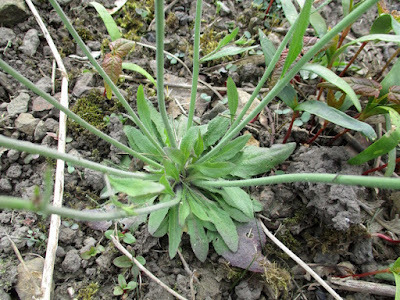 As a common weed it has been encouraged by modernity and has been a product of the expanding garden centre industry over the last sixty years. How often has it lurked at the top of the pot of your new plant? Almost always! 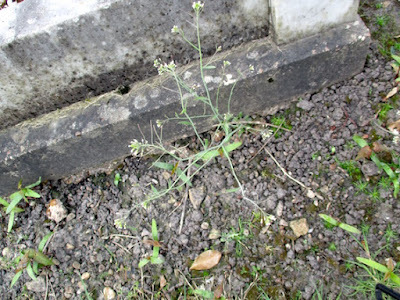 Bittercress is the curse of the nurseryman. 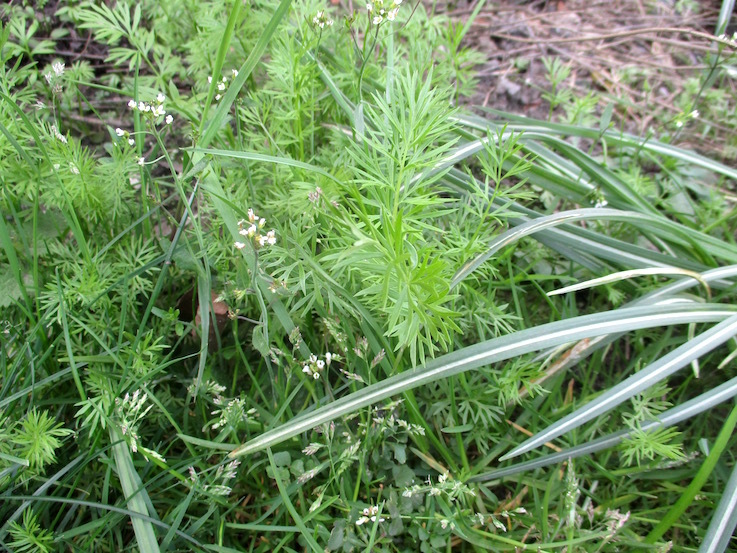 He has historically controlled weed in containers by using sterile or sterilised compost. He also uses residual herbicides to prevent germination of weeds that have blown in. 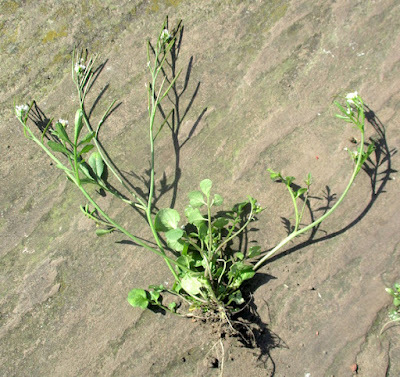 Bittercress rapidly establishes on the otherwise clean standing ground for container grown plants. 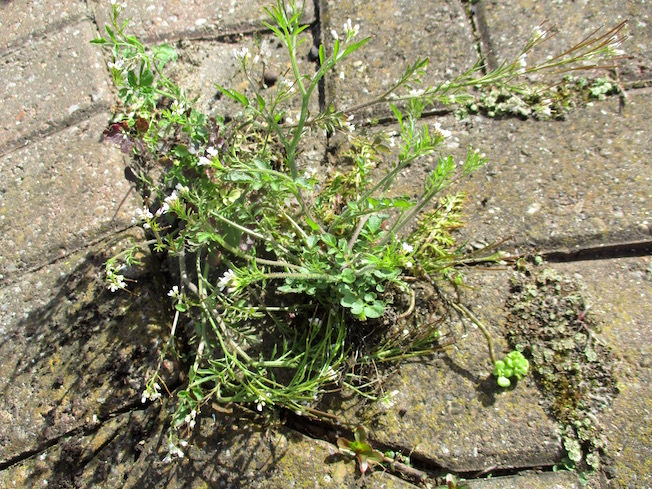 With its ‘exploding’ mechanical dispersal - known to the botanist as ballistic dispersal, bittercress seed is thrown in the air and is flung as far as a meter and straight into plant containers. It’s sticky seed coat helps it hold on. My friend Peter Williams once studied the mechanical distribution of bittercress and how far it would jump! 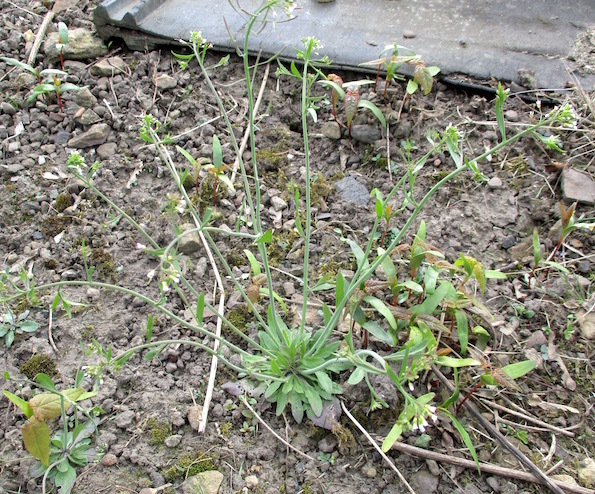 Over the years bittercress has proved to be resistant to the nurseryman’s residual herbicides. The only one that actually worked was withdrawn because of licensing costs. 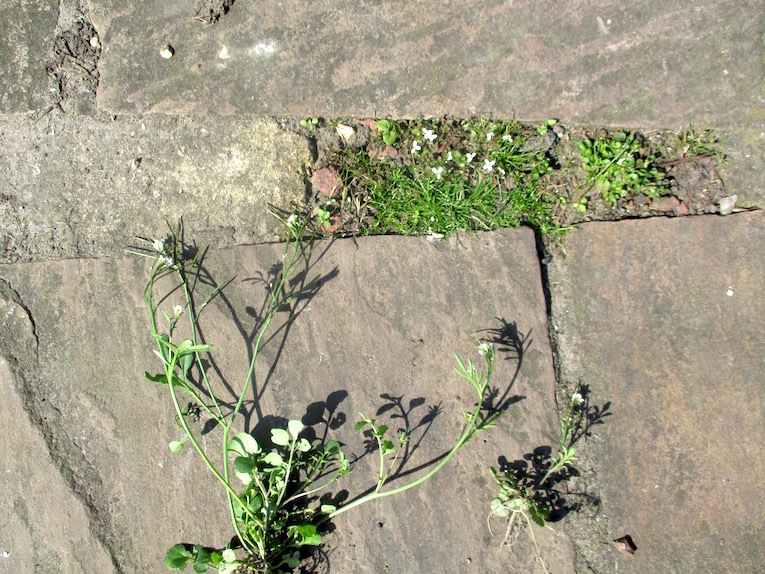 And of course bittercress has been distributed to garden centres far and wide. An extreme variation. 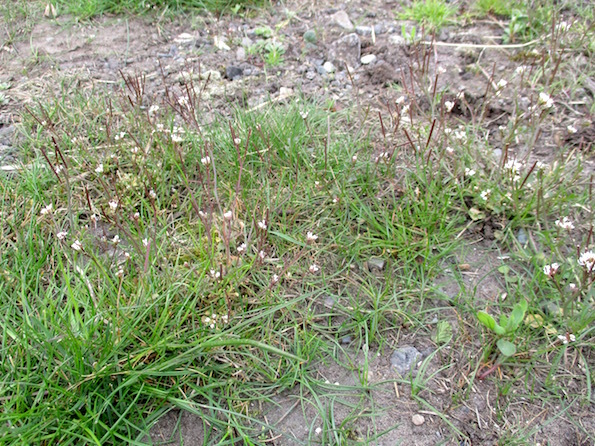 This bittercress is very low growing and is rife in extremely wet conditions. Being such a nuisance hairy bittercress has been much researched - especially in America. Although easily identified there are several forms. Personally I have two and possibly four. 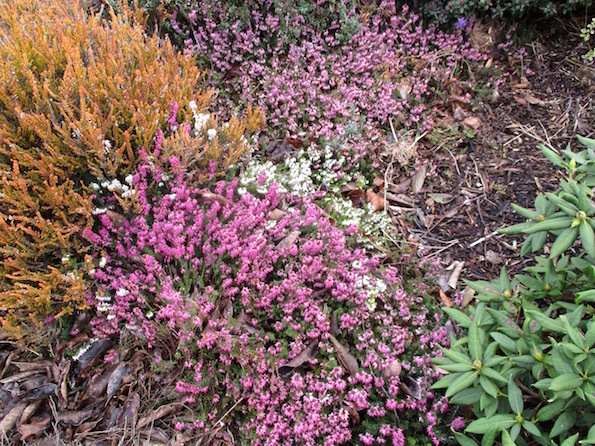 It is difficult to be sure because plants can vary so much with time of year and growing conditions. 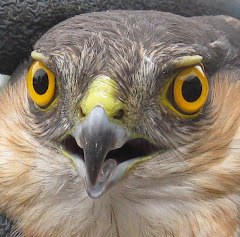 A survey of US nurseries identified four major forms (arguably ‘species’). The RHS name two species in the UK. 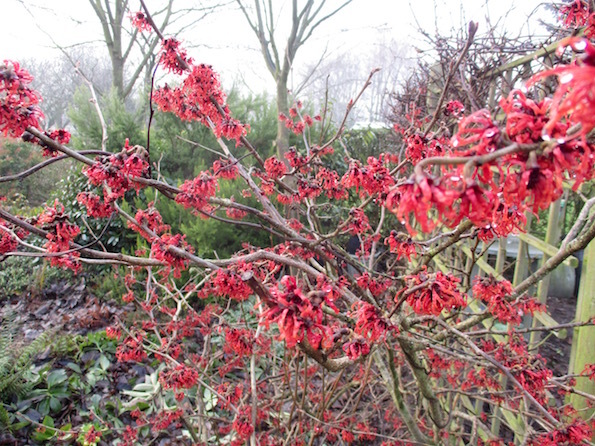 It is difficult to botanically classify the various ‘tribes’ and ‘strains’. 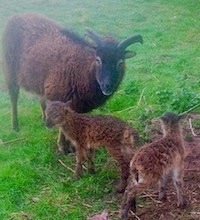 I do find my varied forms maintain their distinct habit and do not appear to cross fertilise. You will have no difficulty in identifying all of them as hairy bittercress when they take over your garden. Superficially they do not seem very hairy to me. Leaves are actually quite smooth. The larger strains (or possibly just the more luxuriant specimens) make quite delicious salad and are not really bitter at all. Shame about the inevitable mouthful of soil. With difficulty! The actual killing is easy - its the timing and access that makes it difficult. 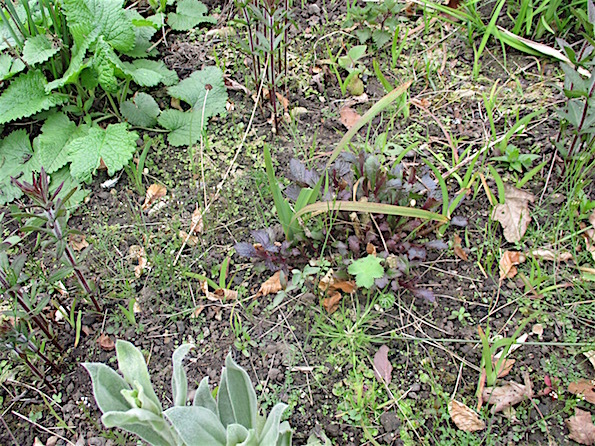 Hand weeding is fiddly, takes a long time and is often too late to prevent seeding. It is actually quite difficult to pull out when very small. I frequently break the seedlings’ necks by sliding my foot over them. Peter Williams agrees with me that in favourable conditions hairy bittercress will set viable seed within three weeks of germination. If you have a heated greenhouse this can be through 12 months of the year. Outside give it nine months when it might be active. Although it can be a problem in Summer and Autumn I find dry soil surfaces restrict it and other than in wet spells I am barely conscious it might be there. 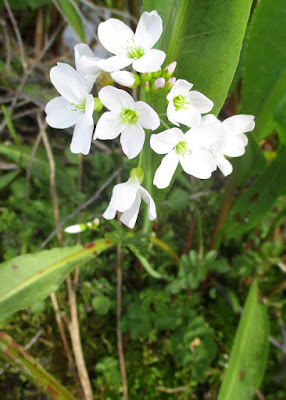 Unfortunately the weather patterns this year for me have been particularly conducive to bittercress and I have never had more! My own control policy is if I see a bittercress seeding - which is most of its life - I kill it on sight. I bend my back and pull or scrape it bootwise or grab my hoe or point my spray. It must not seed! But oh dear how this year I have failed. 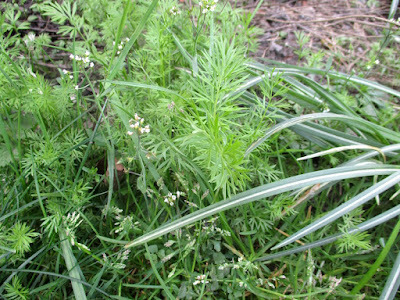 Many gardeners ask me how to control this weed when it is propelling its seed all over their borders. Sorry it’s too late. The only way is constance vigilance, stop it seeding and get it out of the system. You might be in full control in a couple of years. That is if you don’t dig buried seed to the surface - although I must admit it likes the settled soil surfaces typical of non diggers like me! I know of one gardener who advocates very deep mulching to control weed from seed. If you have a clean start with no bittercress seeds popping and are perhaps prepared to cover the contaminated soil three inches deep (phew) I think this will work. Beware any aerial bombardment however. Nothing likes an organic mulch as a seedbed more than newly scattered hairy bittercress. We have another horse in the stable. 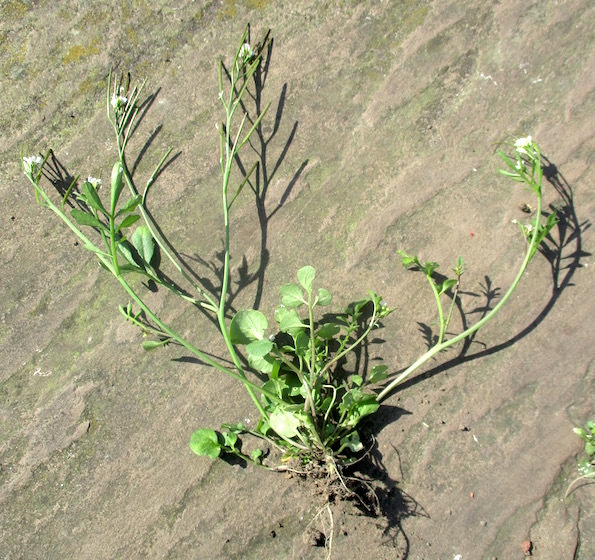 Sometimes actually growing alongside bittercress although this weed tends to be a nuisance in drier conditions. Superficially it looks very similar to hairy bittercress. It loves my own fine sandy soil. 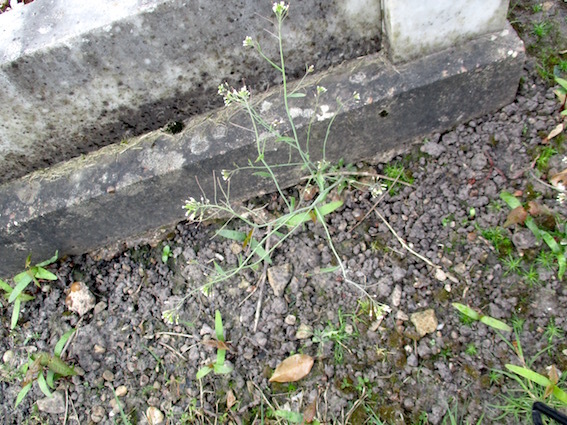 It does not disperse its seed with the same vigour as bittercress but if does seem to set seed even quicker - I can scarcely believe this is possible. 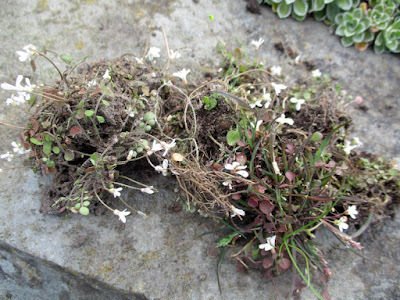 I was shocked in Peter’s garden today how tiny his flowering thale cress in his dry border could be. 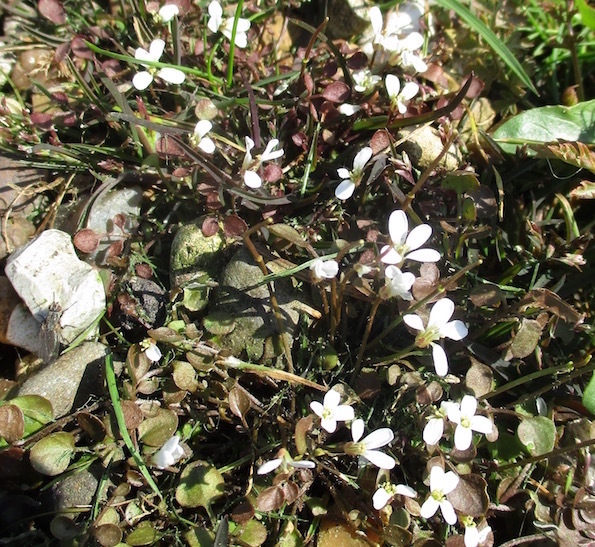 I have spent all Summer trying to see if thale-cress forcefully disperses its seed but it does not go pop for me. 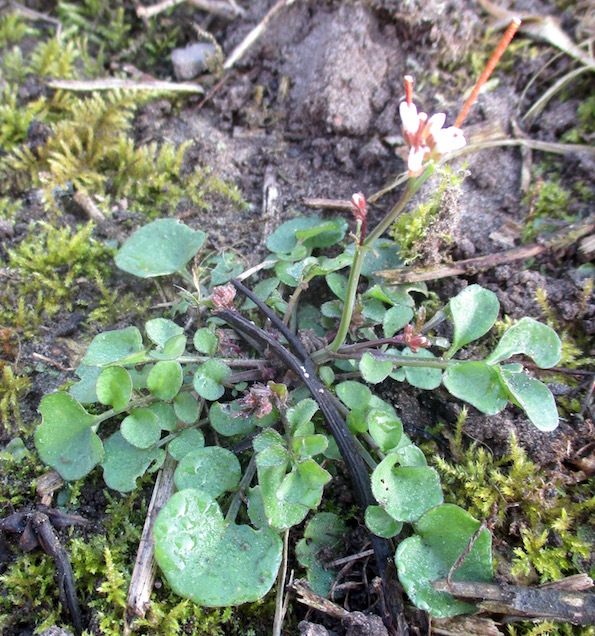 Three ' weeds' in a row - thale cress, honesty and Dicentra cucullaria. 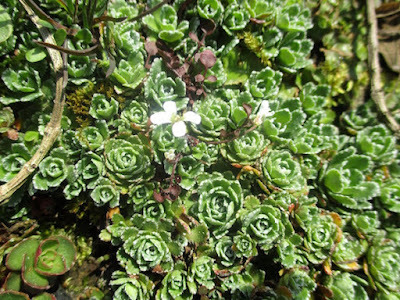 More is known about the genetics of thale cress than perhaps any other plant. It is the darling of researchers. They love getting speedy results from its very short life cycle! I have written about several weeds now. Look for your problem weed in my search box! I asked soil scientist Peter Williams what his three headline bullet points would be about soil acidity/alkalinity for amateur gardeners. His first was that usually it did not really matter! That’s quite something from a man who restored the North’s slag heaps from a sulphur induced pH of 1.5 by adding massive doses of lime! 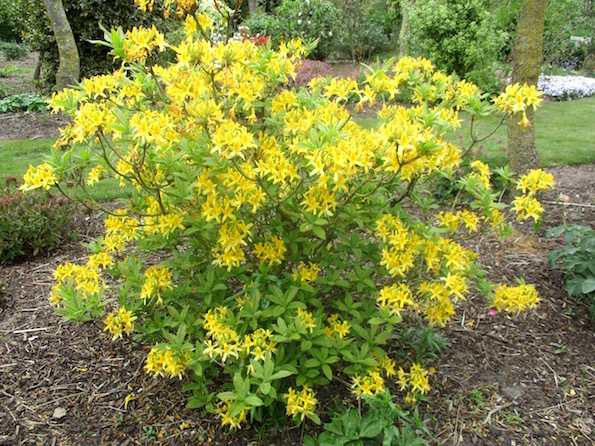 Peter did qualify himself by noting as his second point that there are several acid loving plants such as most rhododendrons that won’t grow on alkaline soils. 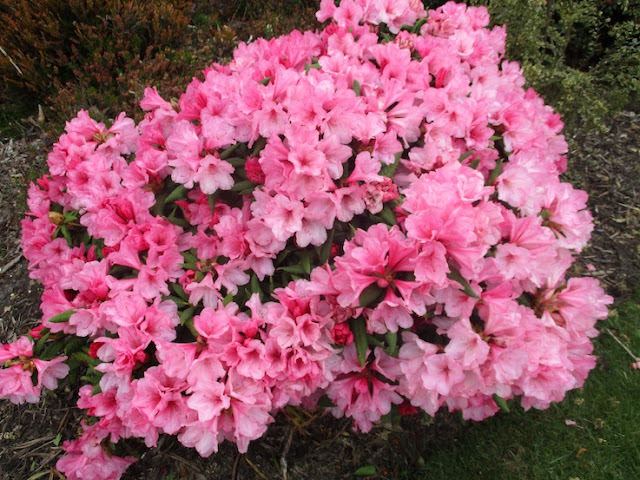 As his great love is rhododendrons it is fortunate that his own silty soil is about pH 5.5. More technically, Peter’s third bullet was that the most important thing about the pH scale for a gardener to understand was that it is logarithmic and that a fall of one unit represented an increased acidity by a factor of ten. For example PH 5 is ten times more acid than pH 6. Similarly if you raise an alkaline soil say from pH 7.2 to 7.3 it’s a greater rise in alkalinity than you might imagine. You can usually learn much about the likely pH of your garden by walking around the neighbourhood and seeing what grows well. That pH testing kits are quite useful (Unlike most amateur soil testing paraphernalia) but be careful what you measure - do you want an average for the generality of a fairly uniform garden or do you want a precise pH for an unrepresentative spot? Although it is easy to make your soil more alkaline it is barely worth trying to make it more acid because it is both difficult, short term and imprecise. Just grow what you can. Although lemon juice might be pH 2 and vinegar pH 3 a UK soil is unlikely to be below pH 4. Nor is it ever going to be higher than 8.5 even when the mineral particles might be composed of chalk or limestone. (Which when crushed are lime). 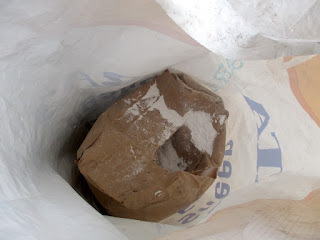 In contrast caustic soda is pH 11. The traditional story is that if a gardener could chose his optimum pH it would be the magic pH 6.5 .At this level there would not be much he could not grow - but it’s far too high for blueberries! pH stands for ‘concentration of hydrogen ions’ Pure water is pH neutral at pH 7. In technical terms pure water has an equal number of hydrogen and hydroxyl ions. As pH rises above pH 7 hydroxyl ions will be in the ascendancy. Considering water a little further it might be noted that ‘hard water’ is alkaline because it contains calcium (and other) ions. By way of illustration when calcium compounds dissolve, calcium ions displace hydrogen ions, thereby increasing the proportion of hydroxyls - ergo pH rises. If I go further it will hurt my head. 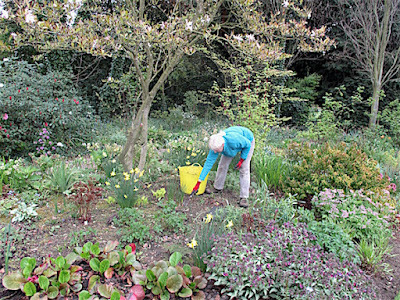 We gardeners don’t really need to know very much more. What we do need to know is the significance of varying pH to our plants. Although the effects of pH on plant growth might be very subtle perhaps the greatest significance to we gardeners is on the solubility of nutrients and their availability to our plants. For example positively charged iron and manganese ions are freely available when soil water is acid. As pH rises these nutrients become ‘locked up’ in the soil and exist in insoluble forms. For plants that have a high iron or manganese requirement when the soil becomes less acid these nutrients become less available and plants become deficient. The other side of the coin is that aluminium (not normally a nutrient) when it becomes too freely available at very low pH becomes toxic. pH also effects how soil nutrient components chemically combine. For example phosphate tends to form insoluble compounds with calcium when a soil is alkaline and similarly with iron when a soil is too acid. Phosphate’s maximum solubility - and therefore availability - is in the range pH 6 to 7. I am reluctant to write much about this as there is so much information on the net and I have written about it before. (Although I can’t find where). Suffice to say that pH is easily raised by adding various forms of lime. 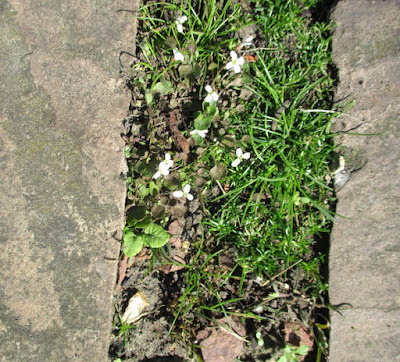 Professionals tend to use ground up chalk or limestone and amateurs hydrated lime - perhaps because the latter is slightly quicker acting and can be applied to the soil surface - often in Winter - and will bring about fairly rapid change. Crushed chalk and limestone is particularly suitable when making up composts when it is intimately mixed with the bulky ingredients. Hydrated lime has a higher liming value than chalk or limestone and is quicker acting but might be best left at the builder’s merchant! My lime outlives its paper bag! Making a soil more acid is rather hit and miss. You might use sulphur or ‘acidifying’ fertilisers such as ammonium compounds or rarely, exceptionally, perhaps foolishly and precariously actual acids! You might conclude I am not very keen on this last one. 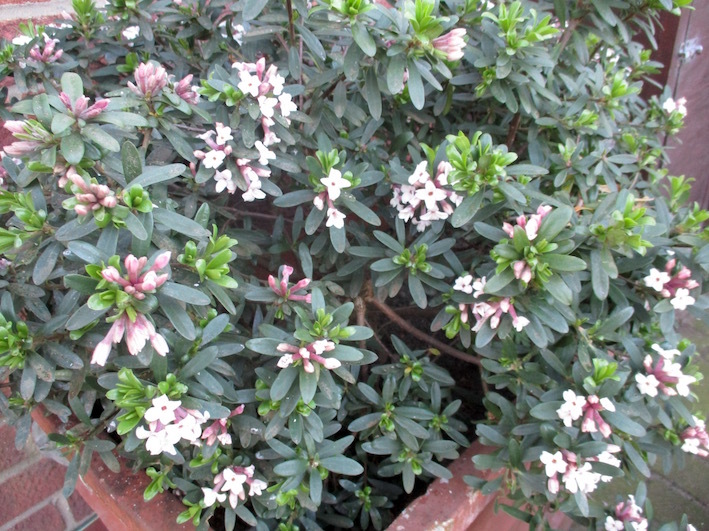 If you have an alkaline soil it is perhaps best if you want to grow acid loving plants such as pieris and camellia to grow them in tubs and other large containers using acid materials such as peat and bark based compost. For smaller plants raised beds have possibilities. 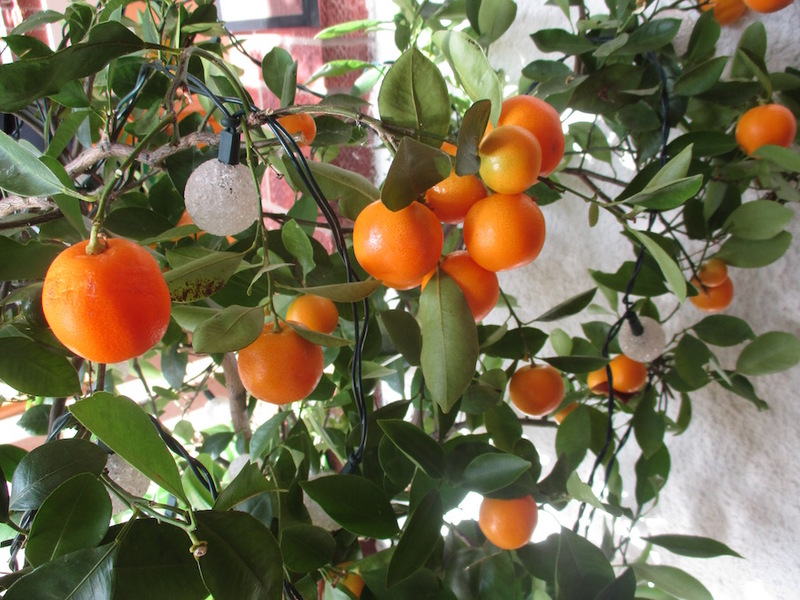 The most successful - but not perfect - method to grow acid lovers in alkaline soil is not to try to change the pH but to use those fertilisers described as sequestrenes or chelates and (usually) apply them as foliar or liquid feeds. My pictures today are mainly plants that must have acid conditions. 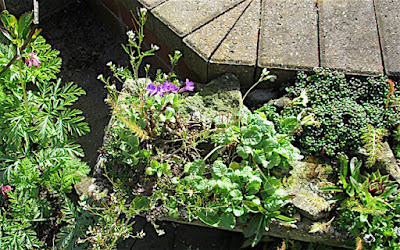 Those not so indicated are examples of the majority of plants that will grow in any normal garden. When I was a lad in industrial Yorkshire, allotment vegetable growers would find after a few years that the effects of sulphur in soot from the polluted atmosphere and the use of the then popular acidifying fertilisers such as sulphate of ammonia would make the soil acid and it was common practice to apply lime every four or five years. 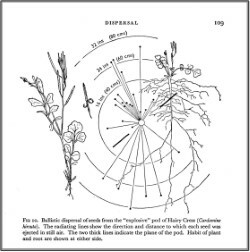 Usually before the brassicas in any rotation. My advice these days would be only to lime allotments if a pH test shows the pH to be falling. Perhaps below six? 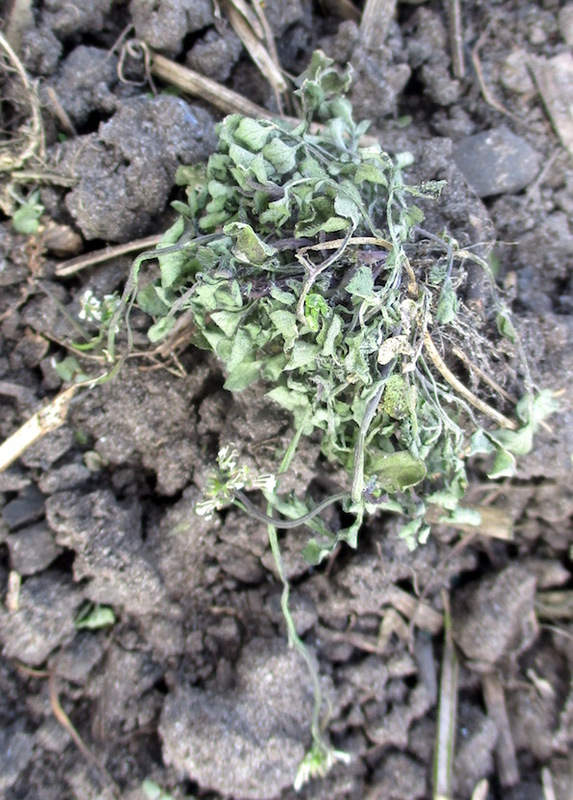 Many gardeners sensibly lime clubroot infested soil to over pH 7 which enables them to grow excellent brassicas. It s not that the brassicas need to be alkaline, its just that the disease hates it! When forty years ago some commercial soft fruit growers started to use minimum cultivations made possible by the then new herbicides some were caught out by the soils becoming more acid and requiring lime. I did not actually know how general this was as an effect of minimum cultivation but it did encourage me to suggest it was potentially a benefit of minimum cultivation for acid loving plants. My further research finds no-till farmers often do find the top two to three inches of their soil becomes acid. 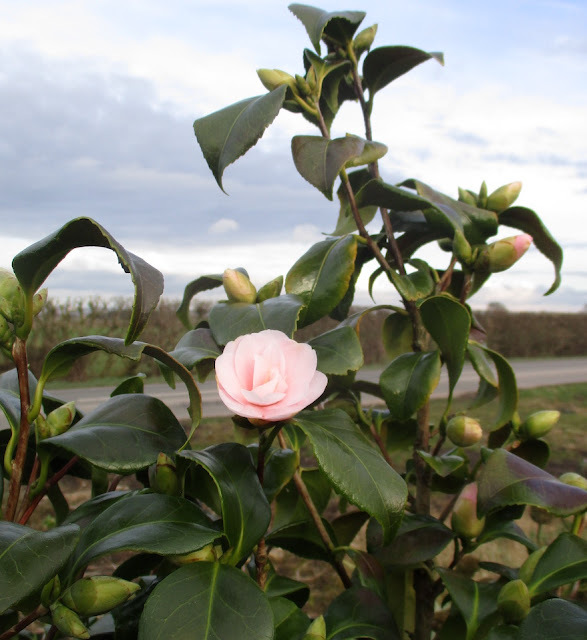 It is due to the bacterial nitrification of their ammonium fertilisers near the soil surface and is easily corrected by normal levels of lime. 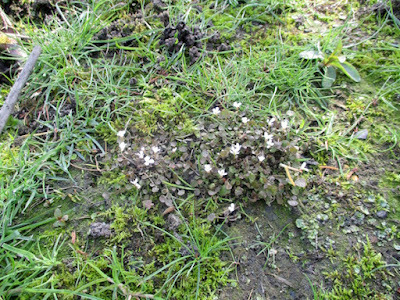 When a former colleague moved into his new house on an alkaline York terminal glacial moraine soil he could not understand why his plants were so sick. That was until he found that the delusional former occupant had applied lime every year! I wonder if his soil attained pH 8 - perhaps even more? A correspondent on my post about iron sulphate to control moss in lawns said that in the US they worried that this would make the soil acid (which is true). 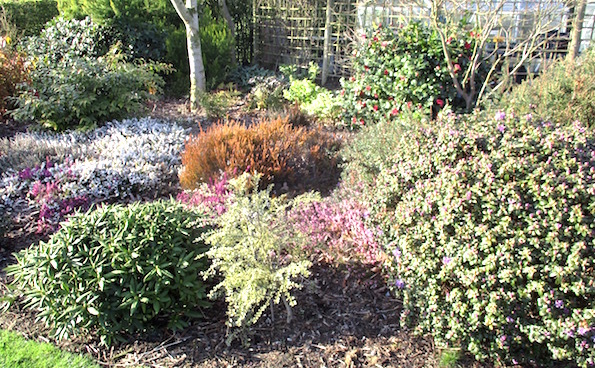 That is great for me as I am besotted with my fine leaved fescues that love soil acidity. The thought does occur that not all lawn grasses around the world like acidity nor does our own ever popular ryegrass need it. 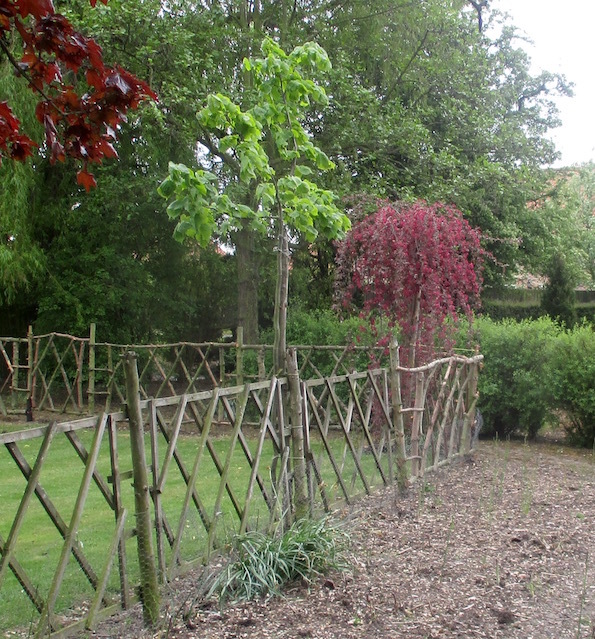 There can be situations to use lime on a lawn! Last week I received an advert from the Hardy Plant Society for two new peat based Levington composts. I recommend Levington as an excellent compost (especially when peat based). Their stated pH was pH 4.8 and pH 5.5. This seems very low compared to a mineral soil for growing the target plants. 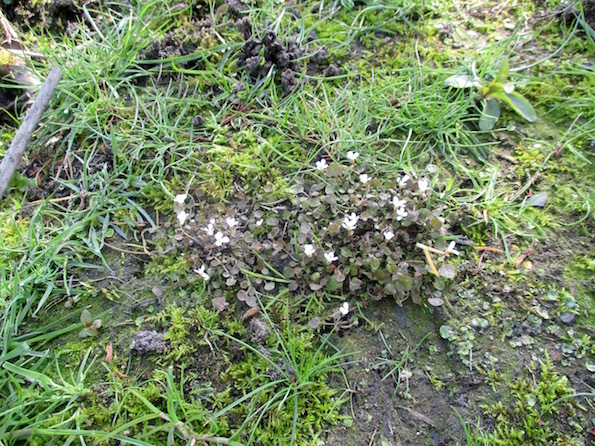 I was reminded that when peat based composts superseded John Innes compost they were fairly acid too. Clearly the optimum pH for best nutrient uptake will sometimes vary with the growing medium. 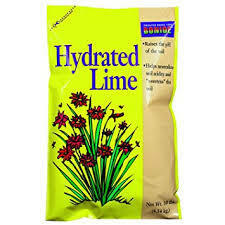 I think a fact that it is often overlooked is that lime apart from raising pH is a source of the nutrient calcium. Arch rhododendron grower, friend Peter sows his rhododendrons in pure peat to which he has added chalk at a tiny 1 gram per litre. (But don’t do this if you have hard water). When we moved into Boundary Cottage we were delighted to be able to grow acid lovers on the pH 6 soil. 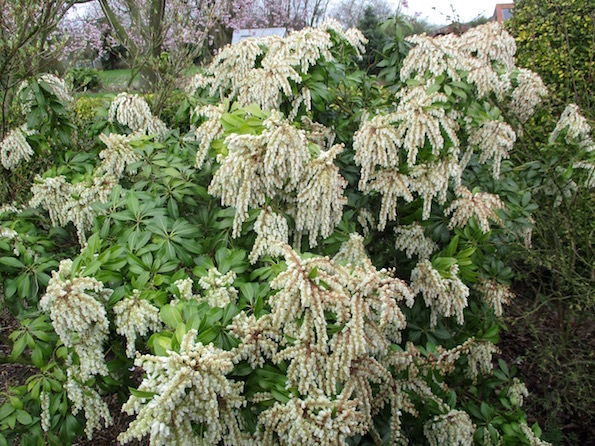 The only evidence of any planting by the previous owner was a very sick pieris! 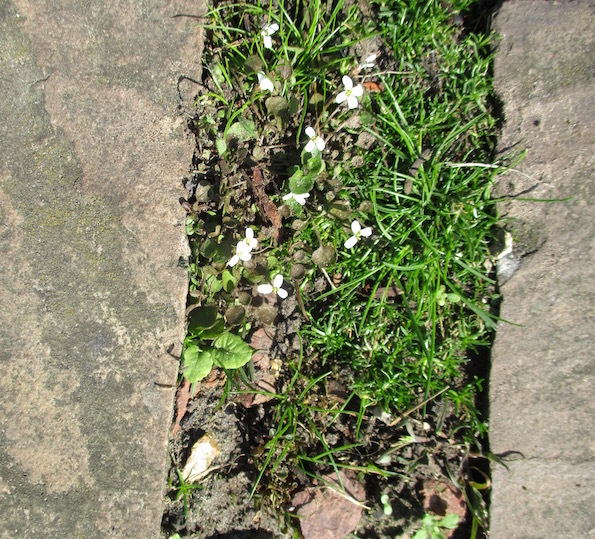 He had unwittingly found the only alkaline place to plant it - at the base of a mortar rich wall! This week Alan invited me over to look at his tree. 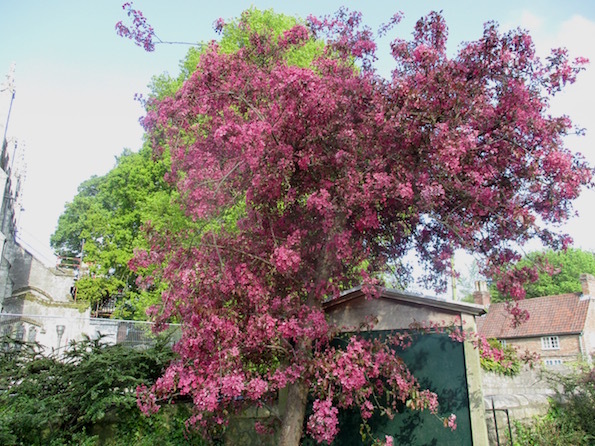 Held back by the recent cold windy weather it was now in magnificent full flower. 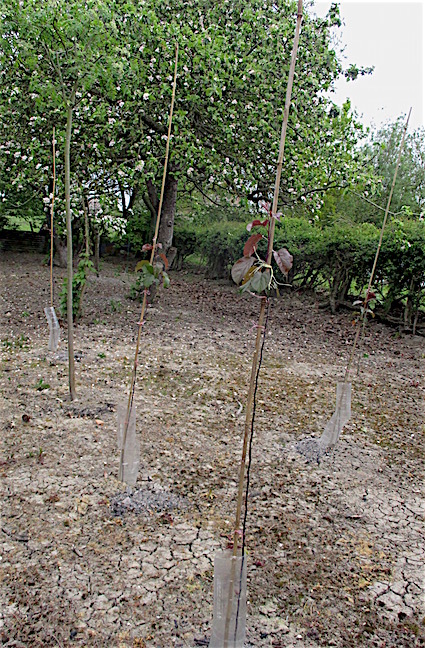 Last year Alan had collected a second tranche of graft-wood for Hilliers and carefully left some thin hanging shoots. With a year of new strong growth it looked very lovely. With lots of interest from Chelsea it is too good an opportunity to not show more pictures and tell you some more! 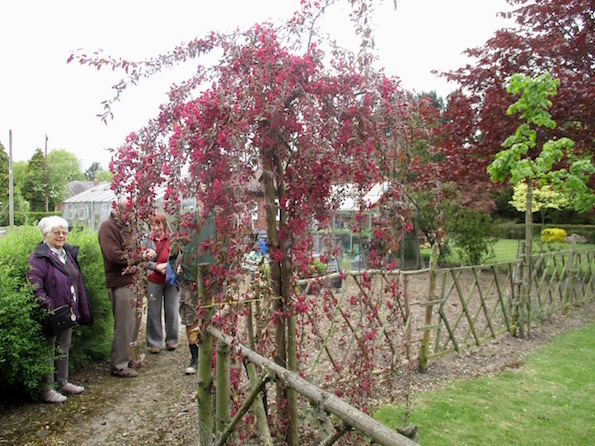 Alan’s tree is a more compact three metres than the height to which it s clearly capable with appropriate training. It’s really ideal for the average size garden. 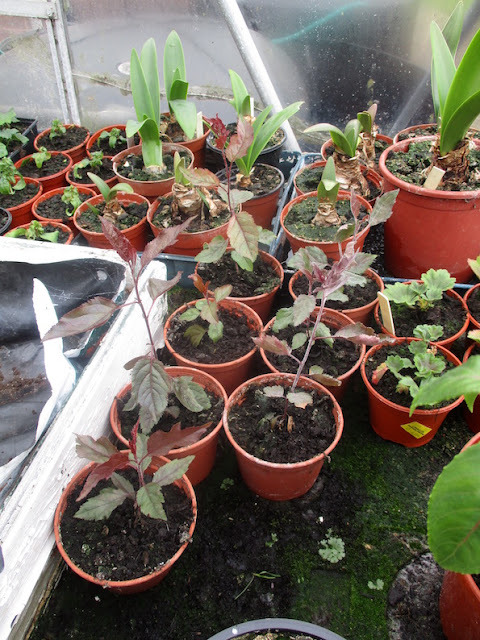 Over the last two years Alan has raised some more young plants from pips collected from ‘Crimson Cascade’. 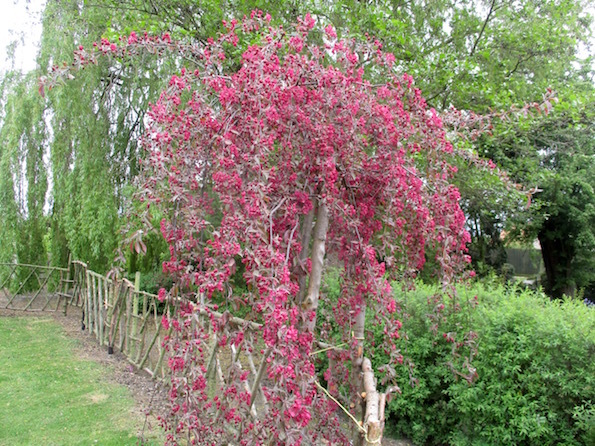 The clear strong colour comes through in the lovely wine red foliage. The eventual flowers will surely be red. Alan confirms my observation that even the young wood is stained red. 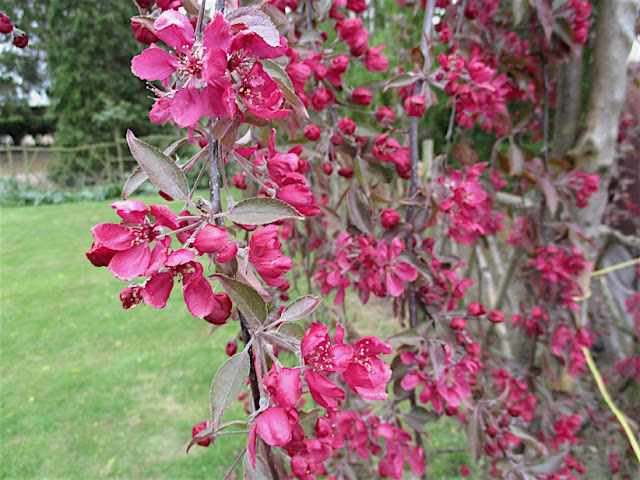 This is also true of ‘Crimson Cascade’ itself and it’s own mother Malus aldenhamensis The strong similarity in flowers, young wood and foliage partially confirms my opinion that ‘Crimson Cascade’ is from a self pollinated flower on Malus aldenhamensis. 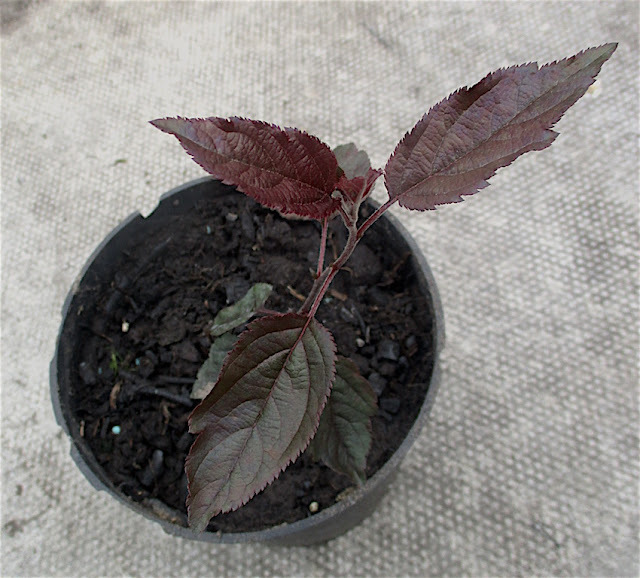 Of course Alan’s new seedlings are most unlikely to share Crimson Cascade’s unique characteristics - but one one can still dream. None of Alan’s new seedlings appear to be pendulous! 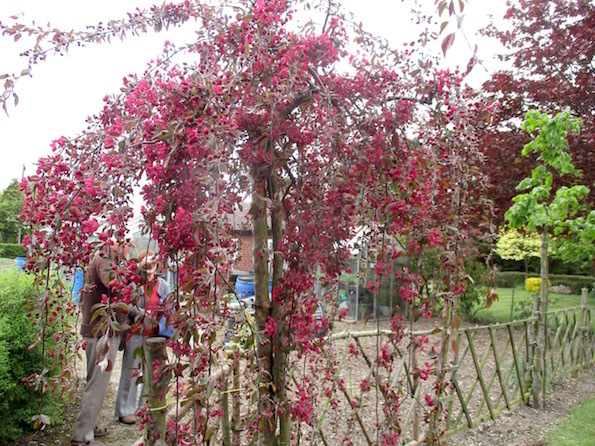 I recently stumbled on the story of the breeding of Malus aldenhamensis. 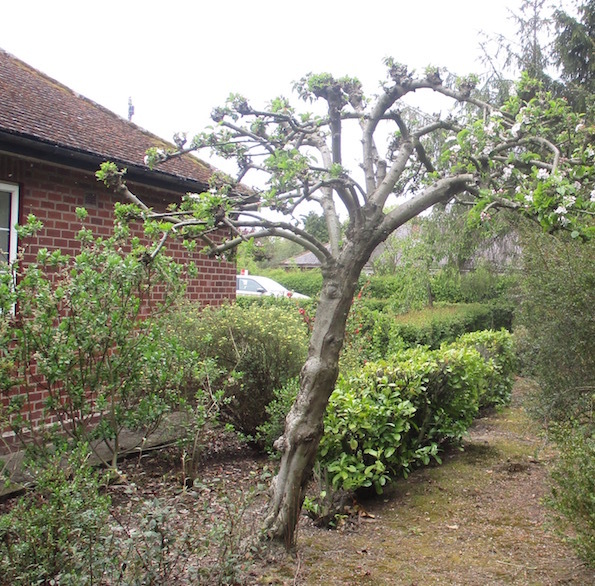 It was actually a chance seedling in the garden of a then well known breeder who lived in Aldenham. 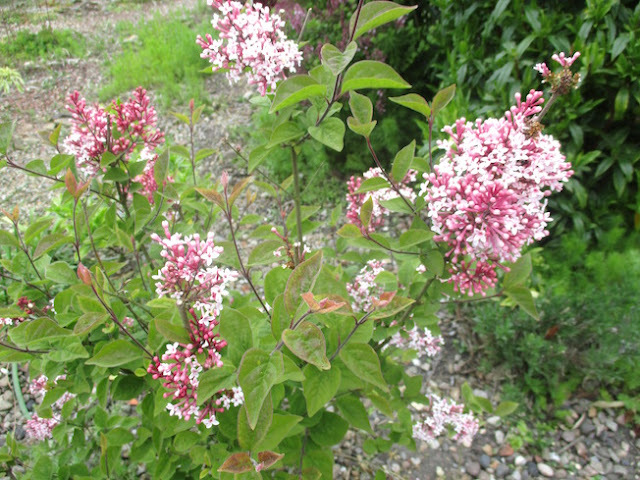 A well connected wealthy plants-lady (Emily Dutton), a friend of the breeder (Vicary Gibbs) took plants back to The Arnold Arboretum very early on after it’s discovery in 1924 and it proved to be very popular over the pond.. I am confident that Malus ‘Crimson Cascade’ itself will be loved in America soon.